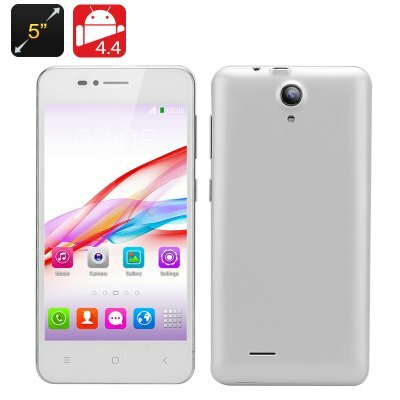 Successfully Added Android Smartphone - 5 Inch IPS Screen, Android 4.4, Dual SIM, Dual Core CPU, Front and Rear Camera (White) to your Shopping Cart. This Android 4.4 smartphone with a 5 inch IPS screen Dual SIM slot as well as dual core CPU plus front and rear camera makes a great entry level contender. This dual SIM smartphone is a perfect introduction to the world of Android 4.4 powered devices. A 5 inch IPS screen is awaiting you, to display all the content on this device in great quality. A dual core processor opens the door to multitasking and every day fun on this stylish Android 4.4 phone as you navigate with ease through the countless available apps from the Google Play store and enjoy features like voice commands, smarter contact arrangement and navigation. With a Dual core MTK processor and 512MB of RAM it partners well with the Android 4.4 system that was specifically designed to work well on devices with 512MB of RAM so you get a smooth system for all your needs. Dual SIM ability is a boon to this dual core Smartphone, letting you run two SIM cards for a multi faceted life. Now you can manage all your work and personal contacts on the same devices through two numbers which makes for easy organizing of your busy schedule.